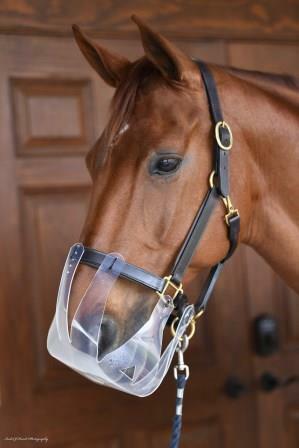 SKU: Flexible Filly Muzzle. Categories: Grazing Muzzle, Shop All ThinLine Products, Flexible Filly Horse Products, Hunter Jumper Tack, Dressage Equipment, Western Horse Tack, Horse And Rider Tack, Bridles & Equipment. Tags: grazing muzzle, horse grazing muzzle, horse muzzle, horse muzzle for biting. Our slow feed grazing horse muzzle that is unlike the typical heavy, hard, and “cage-like” apparatus. We have rethought the design to be softer, lighter and less confining. Constructed of a pliable material that reduces the chances of the muzzle getting snagged, it is also soft on equine teeth and lips. 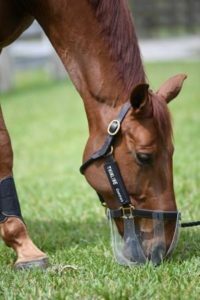 The Flexible Filly Slow Feed Grazing Muzzle is well-ventilated and safe, rated to break just before your leather turnout halter. 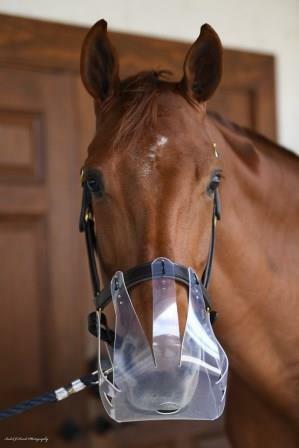 The Flexible Filly Muzzle will not cause rub marks and is gentle on equine lips and teeth. We understand the halter you choose may rub so we designed a set of halter wraps (sold separately) made of our anti-fungal, no rub ThinLine material Available in Black or Brown, one size fits all. Use coupon code ThinLine for extra savings. Wraps will appear below your shopping card after you add your new muzzle. 5 out of 5 stars! I love this grazing muzzle! It’s lightweight and durable. My horse loves it because it’s not bulky like his other one. He hates the other ones. They’re hard for him to breathe out of. Hoping a version for a miniature horse will be available soon!! My mini breaks grazing muzzles all the time. Q I have a draft, percheron gelding. He doesn't wear a horse size halter. When will you be doing a larger size for drafts? I want in! A Thank you for your question! Give the large a try! 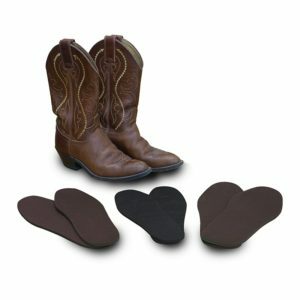 It fits a wide size range and has a 30-day satisfaction guarantee. Q Which size should I choose for my horse who wears a cob size halter? A Thank you for your question! The Medium size (24") Flexible Filly Muzzle is the best choice for ponies, cob size, and full size horses that wear their halters on the smallest holes. Q Does the plastic become brittle after being in the sun for a long time? A Thank you for your question! The high-performance muzzle material is UV resistant. It doesn't react to the sun and also offers some protection for delicate noses.